Peru… I love you and your food! In August 2015, I took a pretty life changing trip to Peru with my sister. It sparked the travel bug and opened my eyes to how truly beautiful the world is. 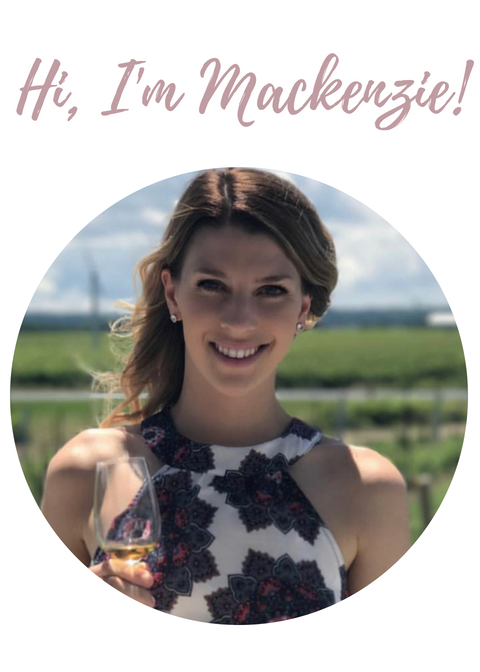 I couldn’t wait to share the culture wave of foods, drinks, and cultural differences! Also keeping in mind, I did try to pair some of the meals with wine, but this trip wasn’t totally about that. My sister and I embarked on a two week (I wish it was longer) hike through the Andes and full Peruvian adventure. Trekking through the Andes was a beautiful, even life-changing experience. I had a pretty rough time with the whole altitude sickness thing and some interesting stomach virus, so I really couldn’t eat anything for a few days. That being said, once we came back from the trek and I felt a little better, I couldn’t help but try all the local cuisine I could get my hands on. 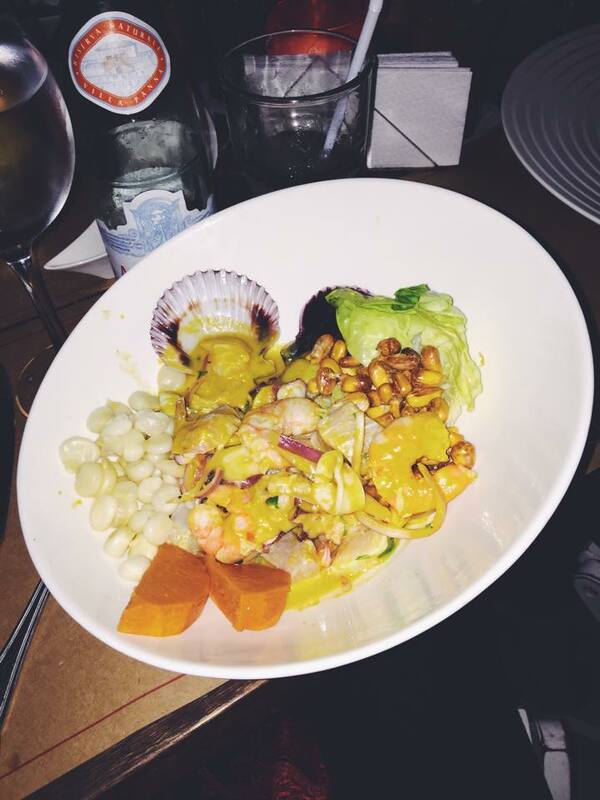 Peruvians have a different lifestyle and that includes the cuisine that they consider a delicacy or a privilege to eat. 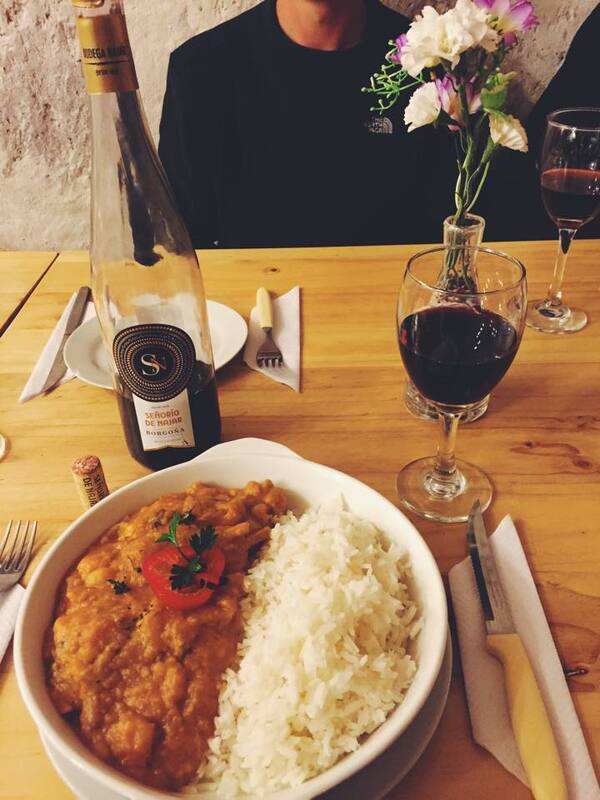 In Peruvian culture, it is offensive and a sign of insult to the chef to leave food on your plate. I love food. Usually I would never leave a speck of anything on my plate, but with altitude sickness on the trek, I felt my appetite being suppressed and for once, couldn’t finish even half my plate. Luckily, the chefs on the trek are completely used to this. Arriving back in Cusco, feeling more like myself and knowing more foodies, we went all out for lunch. 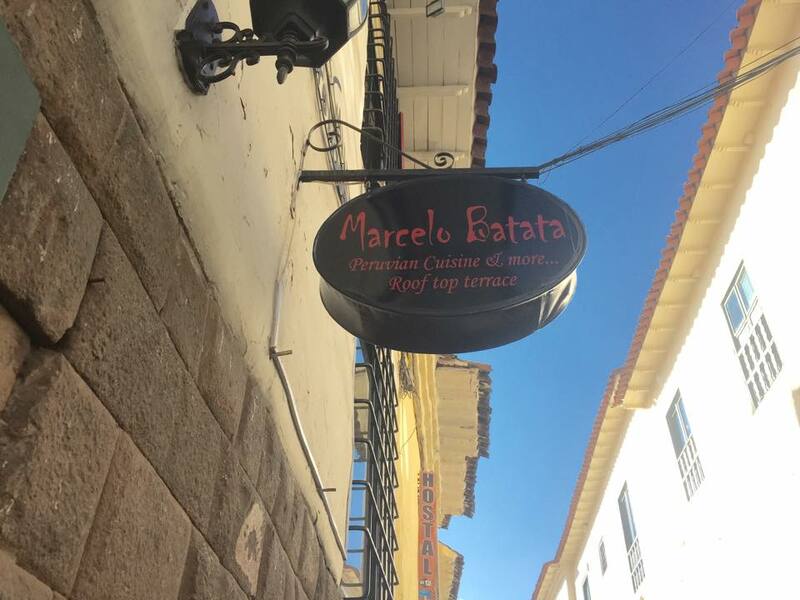 We met some girls from California who suggested we all try Marcelo Batata, an upscale restaurant with highly rated chefs. They could not have chosen a better spot. This restaurant had a breathtaking view of Cusco’s cityscape from the rooftop terrace. 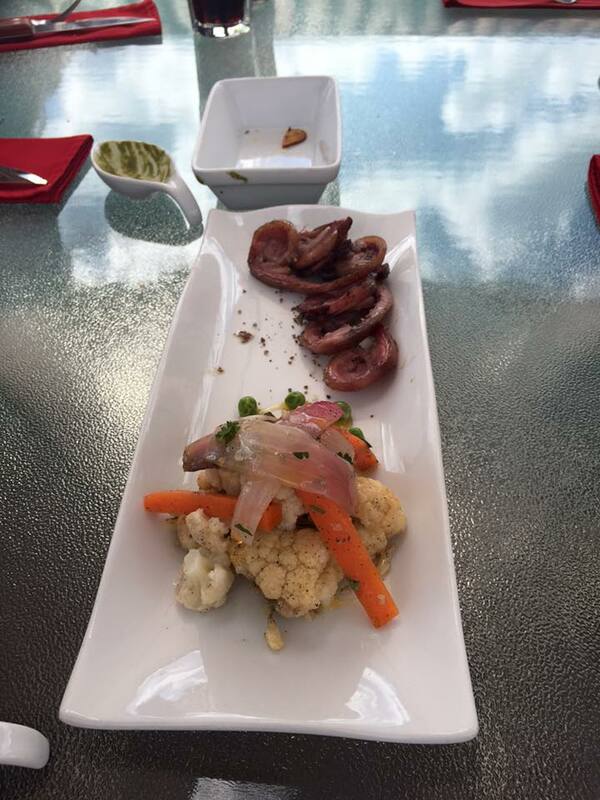 We figured since we all were ready for some real food and had heard all the stories of Peru’s delic acies, we should try the Cuy (guinea pig) and the alpaca Steak. There was no way I was coming home without saying I had tried some crazy things. Normally in Peru, the guinea pig is served on a plate, fried up and flat on its back with everything (and I mean everything) left intact (check out these google images if you dare: https://www.google.ca/?gws_rd=ssl#q=cuy+peru). I saw Cuy at the market a few days before eating at this restaurant and decided I couldn’t handle eating it the traditional way. On the menu at Marcelo, they offered an appetizer of fried guinea pig. This was perfect! I wanted to s ave room for my alpaca steak but wanted a little taste of cuy. The cuy was served fried, in slices with some picked vegetables on the side. To me, it tasted a lot like bacon and I could’ve eaten an entire appetizer to myself. However, I was glad most of us got to try it and compare tasting notes. Apparently, the other cuy you get (the flat on its back, straight up kind) is overly greasy and not as scrumptious. If this style tasted like bacon, I’m okay leaving my memory of it at that! 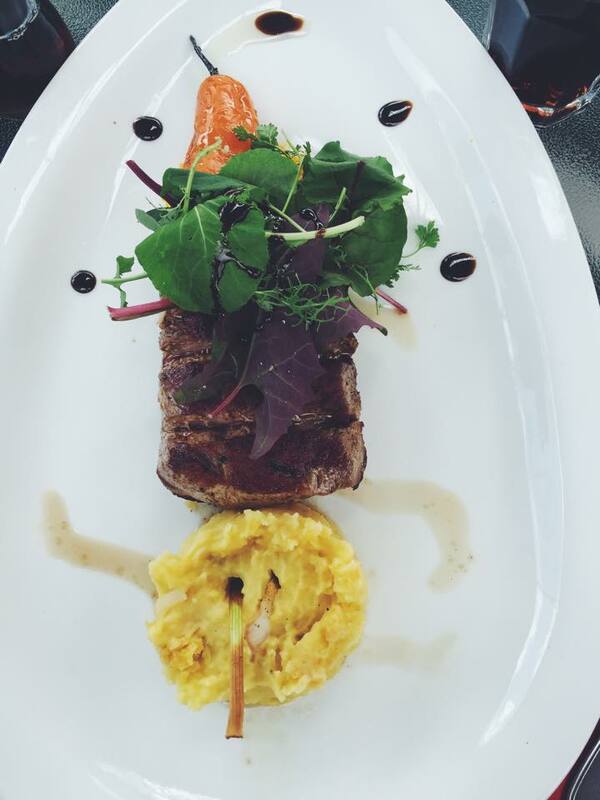 And the alpaca steak? Well right now, I’m sitting at home wondering if there are a) any restaurants that have those around here and b) wondering if I can get a cheap flight back to Cusco, just for a quick steak! That’s how damn good it was. I didn’t know what to expect and when they ask “how would you like that done”, well I don’t know… I’ve never had an alpaca before, so medium-well to play it safe? They usually recommend medium-well, but I went with medium on a whim for its juice and flavour. It came with a spicy pepper, quinoa salad and mashed potatoes (one of many options for potato style). Peru has over 200 kinds of potatoes growing in all kinds of areas, so no mashed potatoes taste the same, like they generally do in Canada. All this added up was 50 soles, which is drumrollllll… only $21.00. Are you kidding me? This kind of service, scenery, and cultural revelation for $21 CAD, I think I’ll be moving here. One of our other interesting experiences happened in Arequipa. We met some guys from Saskatchewan who were also interested in trying all that Peru had to offer. 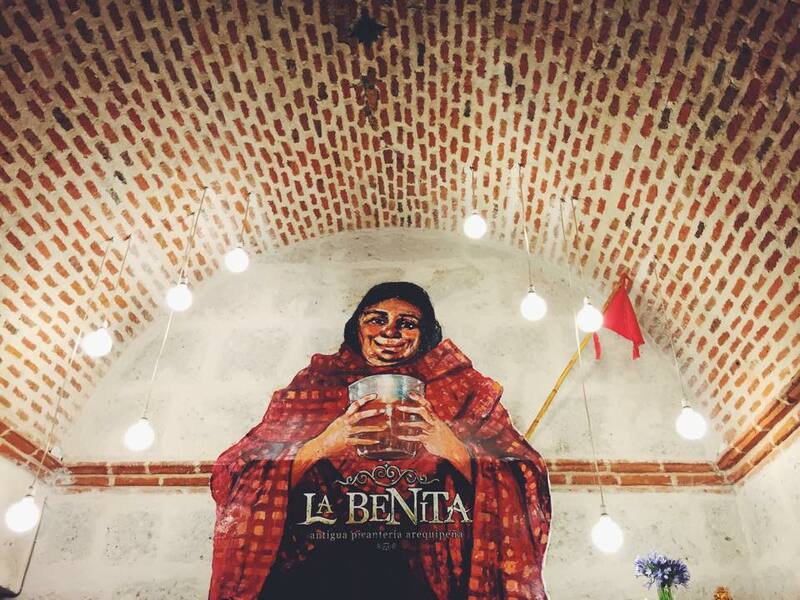 We went for dinner at this restaurant called La Benita. We really wanted to enjoy a couple of bottles of wine with our dinner and unfortunately this restaurant didn’t have a wine list, but were so nice they let us buy some bottles and bring them in with us. They even op ened the bottle and properly served it to us as well. I decided to be adventurous and slightly ignorant considering everything on the menu was in Spanish and I didn’t understand a single word of it. Yep, for me tonight, I will have the Lomo. That technically means loin in Spanish, but really they meant goat. I’ve never had anything more from a goat than its milk (and cheese and yogurt), so I was in for a new and interesting experience. By interesting, I mean chewy, stretchy, stringy, and tough all in one dish. I don’t think I’ll ever be eating goat again. However, something I was very much looking forward to with this crazy meal was the wine. That too, did not prove itself to be tasty. We didn’t spend very much on these bottles and that made all the sense once we tasted them. These were very sweet red wines. They actually weren’t too bad when pairing it with this curry style goat dish. But, needless to say when I bought a bottle to bring home, it was more expensive and the style of grape I knew Peru was well-known for. 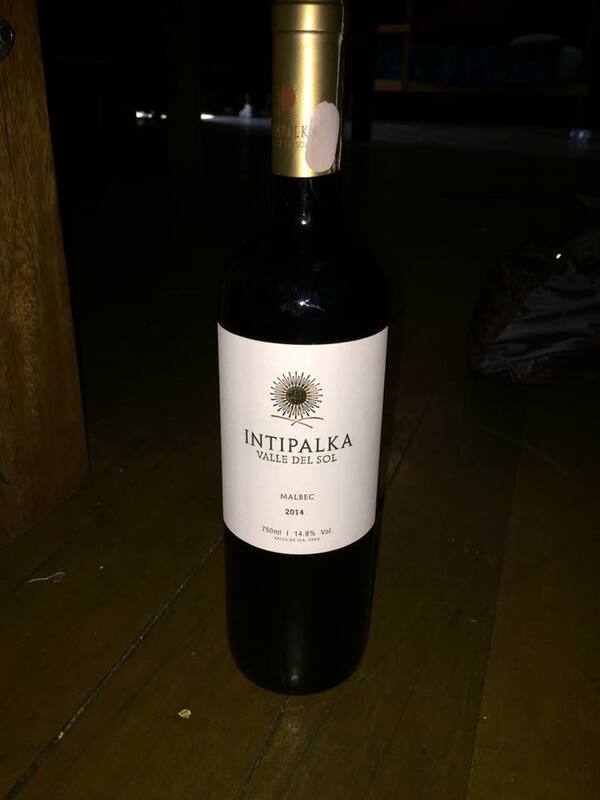 I recently opened the bottle of Intipalka Valle del Sol (Malbec produced in the Ica valley) and it was LOVELY. With this area being generally close to Argentina and Chile being known for its Merlot, Peru has the ability to produce either a Malbec (Argentinian style) or a Merlot (Chilean style) of decent quality. 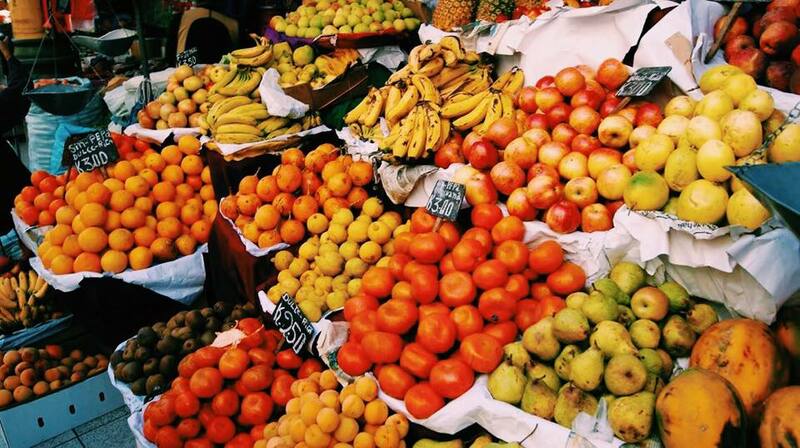 In Arequipa, there is the Mercado Libre Arequipa which is their local foods and textiles market. 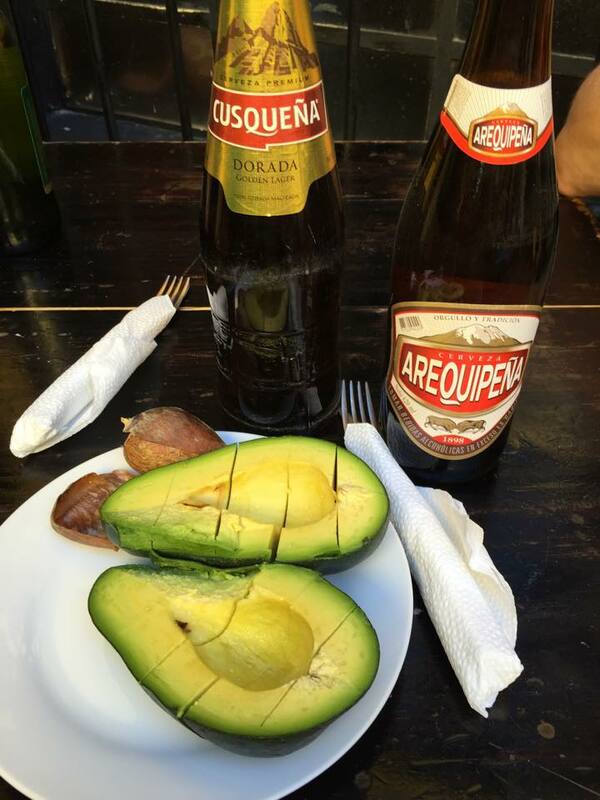 I am some one who is obsessed with avocado and didn’t know how good they could be until being in Peru. The avocados they grow are the size of your face and completely fresh and in season all the time (we were even there during their winter). The meats they offer in the market were presented as if they’ve chopped it fresh off the animal and right onto the board. I actually had to avoid this area after stumbling across a goat’s head. But, we wandered to the areas with fresh potatoes, grains, spices, and fruits. Ahhh the fruits. They have the original Orange Julius in this market. We got fresh fruits blended into a smoothie and served to us in the glass while we walked around the rest of the market. I brought some avocados back to the hostel with me and shared them with the guys from Saskatchewan. 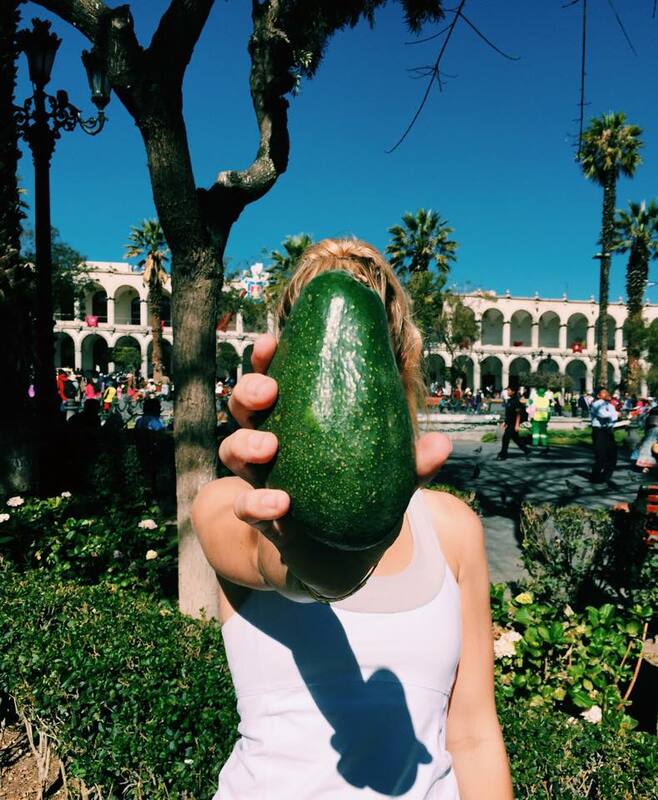 One avocado fed three of us…that’s my kind of cado’! We also drank a lot of “Cusqueña” and “Arequipena” on the trip, which are the main beers of Peru (especially Cusqueña), which is comparable to a higher-end Budweiser. It’s actually a Molson-Coors brand. The last leg of our trip was on the coast of Lima. 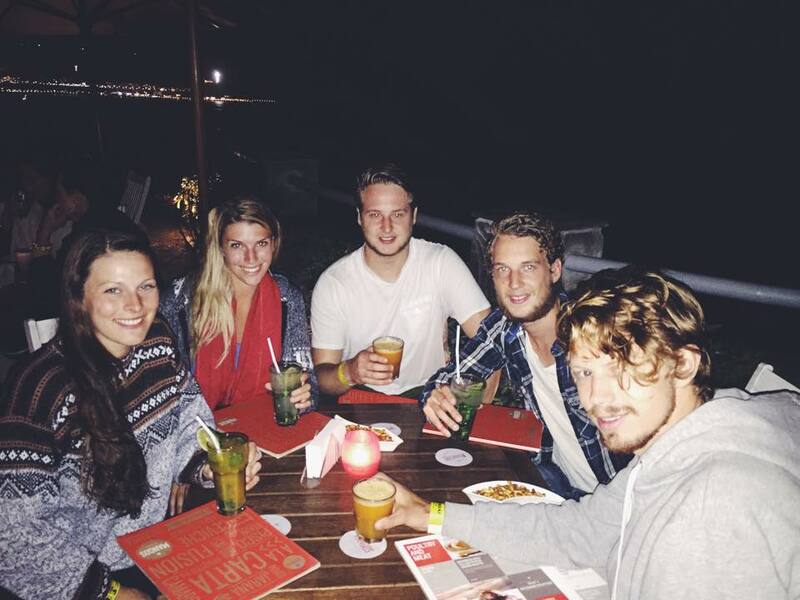 We lucked out by getting to hang out with some Dutch boys we met on our trek through the Andes, on our last night in Peru. We all decided it was time to try anything we hadn’t yet and have some good drinks and an all-out fun last night. We had mojitos (you’re in a beach town and definitely should!) and I finally got to try the ceviche (or here it’s written cebiche). It is basically cold, raw seafood dish with spices (chili peppers) and citrus juices (lemon, lime). This was delicious! I was so happy I got to try this on our last night and know what true ceviche should taste like. If you ever get the chance, explore all that Peru has to offer. And definitely enjoy the cuisine, even if it is a bit outside your comfort zone!